Our days have been of the feast and famine nature. We got up this morning at 4:45 and scarfed down a slice of carrot cake at 6:00 am before shooting pre-dawn. We didn’t get lunch until 4:00 pm and then had dinner at 8:00 pm because the sun doesn’t wait, the weather doesn’t wait, and there is a lot of ground to cover. We’re resting up tonight in the hopes of getting more than 5 hours of sleep. It is absolutely breathtaking out here. I’m not going to leave you without a recipe, but I’ll have to answer the last post’s comments when I get home. A few months ago, I ordered approximately 140 vanilla beans at a great price based on a recommendation from the awesome Jaden. Upon receiving my order in the mail, I began to grasp the folly of my ways. I couldn’t possibly use these up in a timely manner. Best to share the love with people who would give these beans a good home. Even with my remaining beans, I didn’t touch them for a while because I got ill and even *forgot* to use them instead of vanilla extract because I wasn’t in the habit of using whole beans yet. When I first began making ice cream recipes from David Lebovitz’ awesome The Perfect Scoop, I went for some fruity concoctions, but eventually gravitated toward the custard-based recipes. The standard supply of ice cream flavors in our freezer is a rotation of matcha green tea, chocolate, and/or coffee. Those are Jeremy’s three favorites and I don’t generally eat the stuff because it makes my tummy hurt. After making the buttercream frosting for Jeremy’s birthday cake, I had leftover egg yolks. Time for ice cream. 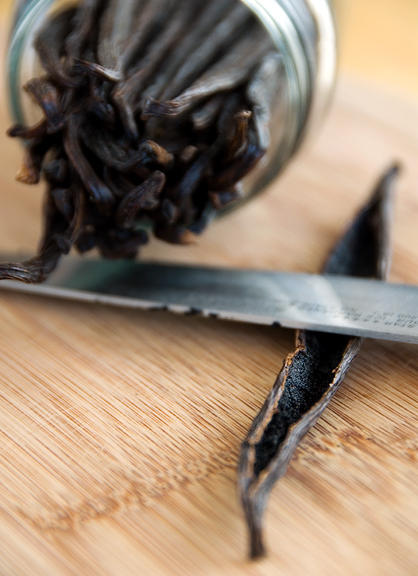 At last, I remembered that I had a wad of vanilla beans languishing in my pantry. A great opportunity to try one out. I announced to Jeremy that I was going to make vanilla ice cream. I noticed the lack of glee in his expression and couldn’t discern if that might be because he wasn’t thrilled with vanilla or because he had overdosed on so much cake the entire week preceding. It didn’t matter if Jeremy wasn’t enthused about the vanilla ice cream before, because when he tried it out of the ice cream machine he declared it was The Best Vanilla Ice Cream he had ever tasted. That in itself might not mean much, but he had it for dessert every night until we left on this shooting trip. That’s quite the compliment, but I have to pass the kudos along to Mr. Lebovitz who has renewed my faith in homemade ice cream with his bomb-proof recipes. Uh… yum! 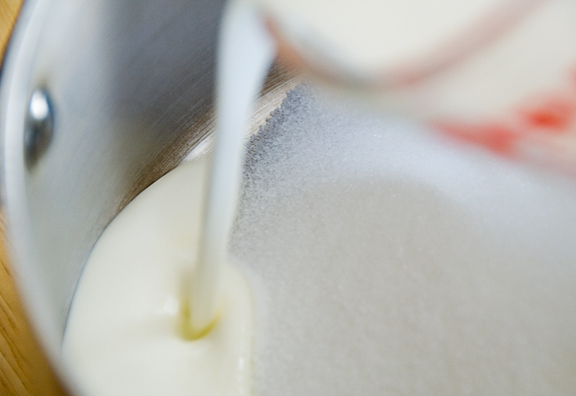 Warm the milk, sugar, 1 cup of cream, and salt in medium saucepan. Scrape seeds from the vanilla bean into the warm milk and add the bean as well. Cover and remove from the heat. Let steep at room temperature for 30 minutes. Pour the remaining cup of cream into a large bowl and set a mesh strainer on top. 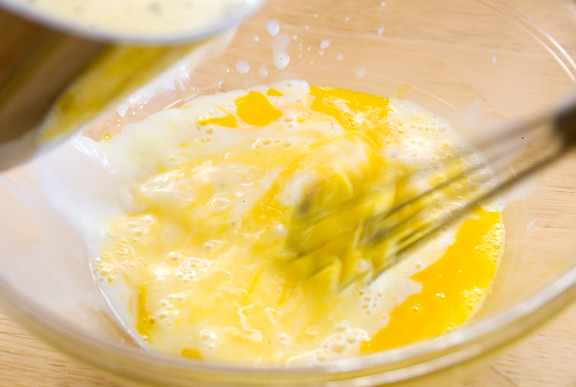 In a separate bowl, whisk the eggs yolks. 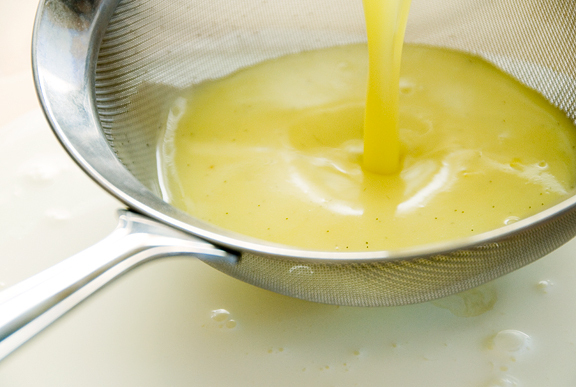 Slowly pour the warm cream mixture into the egg yolks while whisking constantly. Scrape the mixture back into the saucepan and stir it constantly over medium heat with a heatproof spatula until mixture thickens and coats the spatula. 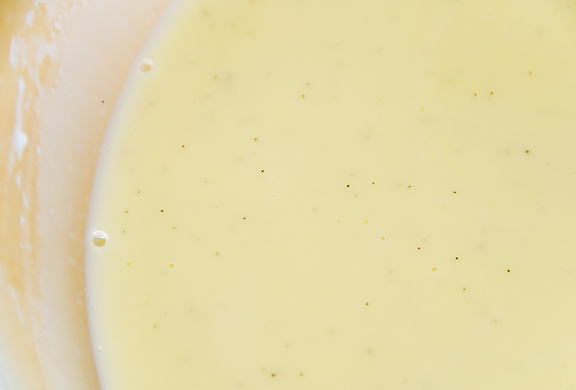 Pour custard through strainer and stir it into the cream. 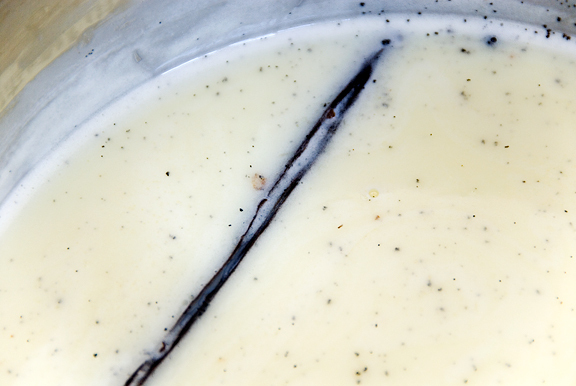 Put the vanilla bean into the custard, add the vanilla extract, and stir until cool over an ice bath. Chill the mixture completely in the refrigerator. When ready to churn, remove the vanilla bean (rinse it and reserve it for another use) then freeze the mixture according to the ice cream maker’s instructions. I have an awesome stash of beans thanks to Jaden, too! I won her raffle, and ended up giving away many handfuls to happy friends. And DL’s ice cream recipes rock. Every one I’ve tried has been a winner. Where were you shooting? 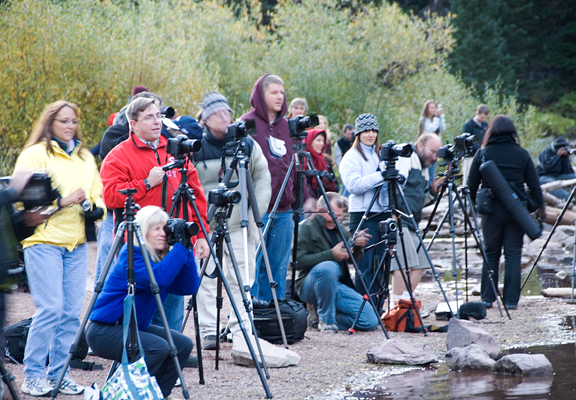 RMNP? I’m kicking myself for not getting up to the mountains this weekend. Your pictures are kicking me, too. Beautiful shots. We had a black lab all during my childhood. I remember she went everywhere with us and when we got ice cream cones, so did Dixie. Your corner of the world is just simply heavenly! Those colors are amazing and extremely beautiful! Thanks for sharing those wonderful pictures with us! What a delicious ice cream! Homemade ice creams are NEVER plain! even if you miss the challenge is a real pleasure enjoy your shots the nature in and out the kitchen. If this kind of REAL vanilla ice-cream is what I can get it here, I will give it equal chance like Chocolate. This is certainly the best vanilla ice cream I’ve made as well. The photos are amazing! I can’t wait to see what else you’ve taken. I WANT an ice cream maker. I MUST have an ice cream maker. I WILL get an ice cream maker. God, that looks fantastic. Soon as I move (trying not to accumulate more stuff this year!) I’m getting an ice cream maker and doing all of David’s recipes. Wonderful fall colors! Can’t wait to see the pics! Everytime I make vanilla custard when I am home visiting my brother, my niece wants to drink it…just like milk. Can’t even save enough to make it to the ice cream machine!! Looks wonderful Jen! Those falls colors look almost as good as I am sure that the ice cream tasted!! Wow, that’s a lot of vanilla beans…but I’m sure you’re going to put them all to good use. I should do the same…I always seem to run out of vanilla way too fast! Yum! I made about 20 ice creams this summer, most from DL’s book. Every single one worked. To me, that’s a miracle, and his is the only book I’m buying this year. Your photos make me jones for Colorado. We might get out there in March for skiing, but by then it will be far, far too late (and too early). Oh, well. That looks fantastic! If there was only one ice cream book in the world that I was allowed to buy it would definitely be David Lebovitz’s. I actually made the butterscotch pecan today for the second time and it’s absolutely amazing. I just adore the speckledy look of home made vanilla ice cream. Yummmmmmm indeed! I know all about a tasty stash too. :) Glad you’re having fun shooting! Okay, I -need- to get me an ice cream maker! What kind do you use, Jen? 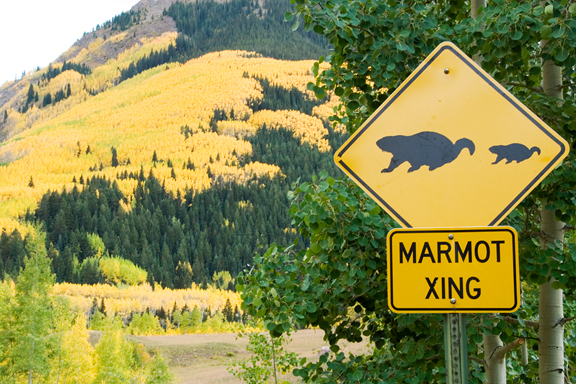 Love the road sign. Your ice cream looks spectacular! Your photos are absolutely beautiful. I really enjoy them and your recipes….. 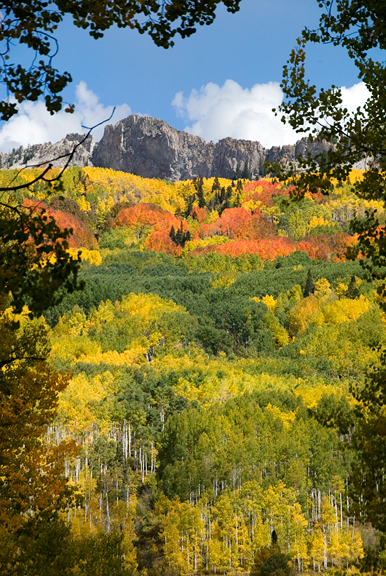 I am blown away by that picture…those colors, it just screams everything that I believe to be Fall. And ice cream, well that just speaks for itself. That’s it, I have to get an ice cream maker for my birthday! I am placing my vanilla order today! Those prices are amazing!!! Your photos make me want to go to Colorado so bad!!! I have been twice. I want to move there someday. I have to agree that this is the BEST vanilla ice cream I have ever had/made. I made it for the 4th of July. Mmmm! I’ll have to check out the place to buy vanilla beans as I’m sad to say I spent far too much at Williams Sonoma. I have your page bookmarked because I love your pictures. They often look like paintings and usually give me the chills. Don’t stop! Have you tried making your own extract with several of your remaining beans? I’ve been using up some that way (as well as used pods; just rinse the ones that’ve been in cream well), and also I store many in sugar so I always have a huge supply of vanilla sugar too. Didn’t know if you were doing that, so I thought I’d toss it out there. 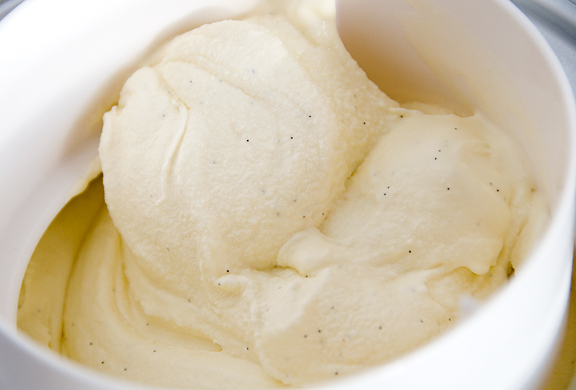 There’s nothing plain about vanilla bean ice cream, it’s delicious! I love the golden shot of the trees. Mark – it made sense :) I think Jeremy just can’t handle so much fat and sugar all at once. He doesn’t have a lot of mass to handle it all! Cynthia – awwww, that is so sweet! Rosa – why thank you, dear! Mrs. E – it’s gooooood stuff! Bridget – thanks! 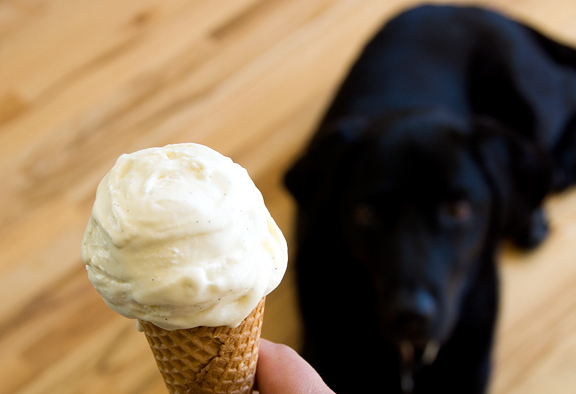 I love this ice cream too – the flavor is awesome. Andrea – thank you, I *am* feeling better! Lucky you for getting an ice cream freezer! I love DL’s book. Judith – that’s a great goal. Tartelette – oooh, I would love to drink custard (my MIL has a great boiled custard recipe – I’ll post it this fall). Anita – I had to stash them in a tight glass jar b/c the odor permeated EVERYTHING :) They are lovely. 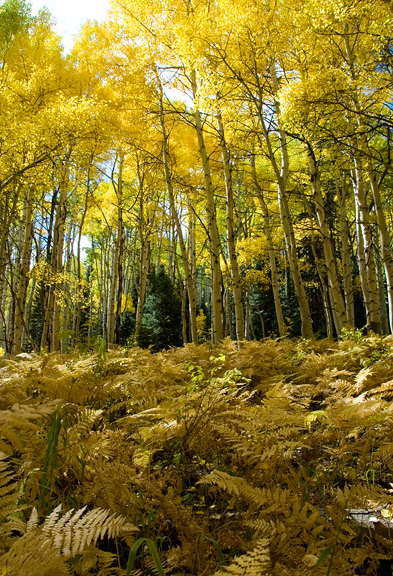 Fiona – Colorado is awesome any time of year, but it is quite spectacular right now! I think DL’s book is phenomenal. Mollie – me too, vanilla bean is so dope! Holly – we just have a cheap (?) cuisinart brand ice cream machine. I got it for $40 years ago. Easy peasy! Peabody – it’s never too cold for ice cream, no? Sonya – thanks! Thank you for the tag too, I hope it’s okay if I don’t follow through with it. I never have the time! Sarah – go for it girlfriend! Nate – if you love ice cream, this is the way to go! Tipperella – oh I know, even in normal grocery stores it costs too much! Brilynn – thank you, sweetie! I NEED to buy an ice cream maker. Or not. I could get addicted, couldn’t I? Jen, may I ask you something? 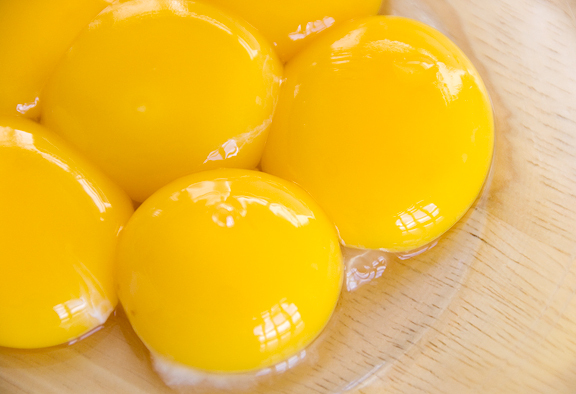 How long do you keep your yolks in the refrigerator? I know it’s a silly question, but it will help me a lot. Tks, darling! fantastic shots. next best thing to actually being there. thank you. rock on jen. Jai – aw, thanks hon! wow your site has never steered me wrong. i just made this vanilla ice cream and it is incredible. thanks so much for posting and for your lovely pictures!